Christa from Christa Quilts is offering a $20 gift certificate to her shop! 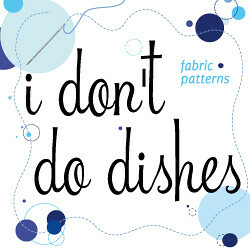 Caitlin from I Don't Do Dishes is offering a $15 credit to her shop! 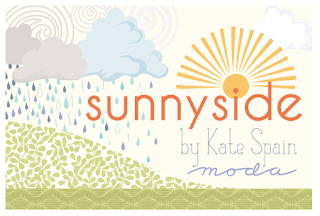 And, last but certainly not least... because my original lantern quilt top was made with Kate Spain's Good Fortune, Nicole from 1 Choice 4 Quilting is offering a charm pack of Kate's new line (that I'm already trying to decide in what capacity to buy): Sunnyside! 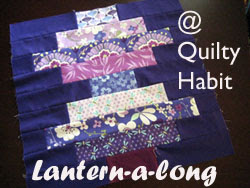 Thank you so much again to the sponsors of this QAL/LAL! You can click the buttons above to visit their shops! The first block tutorial will be out on Tuesday. I love how quick these blocks come together, so you should totally join! :) You need a jelly roll or 2.5" strips of your fabric, plus background fabric (see yesterday's post for more specific materials). Mon. August 19 - Winners chosen at random from the linky pool! I'll be back soon with more recent sewing and to set my July goal! We have several that have come on board, but we still need many more!